I thought I’d start the new year with a song by Ryan Keberle, trombonist and leader of the group Catharsis. This chart is based on their live performance on NPR’s “Tiny Desk Concerts” series, a cool platform for bands to play stripped-down, acoustic versions of their songs. The version on their album In the Zone has more improvisation, especially at the fermata before the trumpet takes the melody. 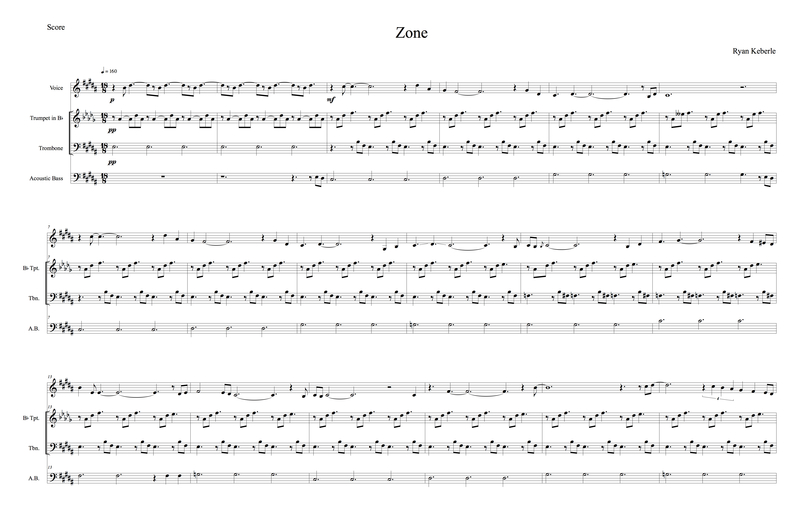 As a bit of an experiment, I notated the score in 18/8. This way I don’t have to write a 6/4 chart filled with triplets. This entry was posted in Uncategorized and tagged jazz, music, Noteheads, Ryan Keberle, score, transcription, Zone on January 2, 2015 by noteheads.